Cnut was a Danish king who invaded England during the 11th century. 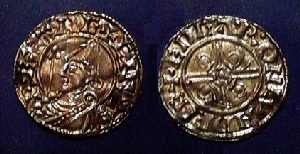 It was during the reign of King Aethelred II”the Unready”, the English attempted to hold the Danish invaders off by paying them tribute known at the time as “Danegeld.” Athelred II’s English subjects were hence heavily taxed and moral was quite low throughout the nation making him a very unpopular king. In 1016, the Danish King Cnut invaded England. At first, he agreed to share the throne with Aethelred’s son, Eadmund II , but this arrangement did not last very long. Eadmund was defeated in November 1016 and Cnut took possession of England. To promote order, Cnut then married Emma of Normandy, the widow of Aethelred II. Thus England was incorporated into Cnut’s Scandinavian empire. Despite this foreign invasion, England faired much better under Cnut than Athelred. Cnut went to great lengths in attempting to bring England into his empire. In a conciliatory jesture, Cnut married Athelred’s widow and even converted to Christianity. In fact it was his religious conversion that prompted the monks at Ely to write a little song that has endured the ages – “Row, Row, Row your boat, life is but a dream…” a reference to pretending that all was now well since Cnut became Christan. It was actually during the reign of Cnut when England became more organized as the development of shires and shire courts were formed with their “shire reeves” otherwise to be kbown as “sheriffs.” Nonetheless, this organization was needed since the unpopular taxation of the “Danegeld” was maintained. While Cnut was succeeded briefly by his two unimpressive sons Harold I and Harthacnut , eventually the throne would pass back to the son of Athelred II known to history asEdward the Confessor.